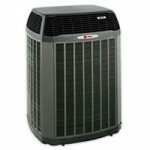 Last week, I had my yearly service performed on my heat pump system. They come out and clean the coils, and check everything to make sure it’s working. This year, though, the tech said there was something questionable, in that the subcool was too high, and that there seemed to be too big a temperature change on each side of the liquid line filter drier (LLFD). So, they suggested a service tech come out, and take a look. Fine, though I wasn’t looking forward to the cost.